This morning we got up bright and early and headed out to the garden to work. Ha ha ha. Actually, we slept in, but that didn't seem to matter too much. I had gotten some decent progress on the trenches yesterday, and this afternoon I went out and did a bit more digging before fetching Noel to help with the hard stuff. While Noel dug, I worked on running the pipes from the manifold. I only recently re-found my careful diagrams of the system a few weeks ago, which was a good thing because I forget between bouts of working on this just what I'd planned to do. Today I added three circuits to the manifold. One for the orchard trees, one for the orchard plants (which need water at different times and in different quantities), and one to run out to the back of the garden. Then I began the tedious process of gluing pipes together. 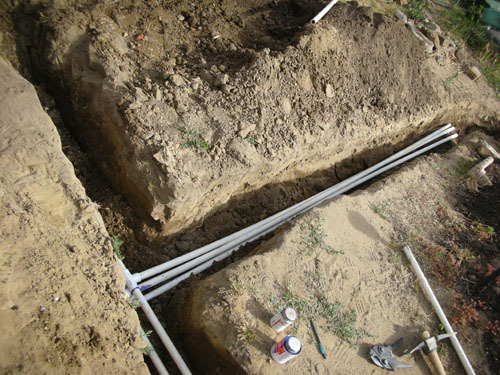 We knew we didn't have enough pipe to finish the job today, but we were able to get past halfway done; tomorrow we go purchase more pipe and finish the job. 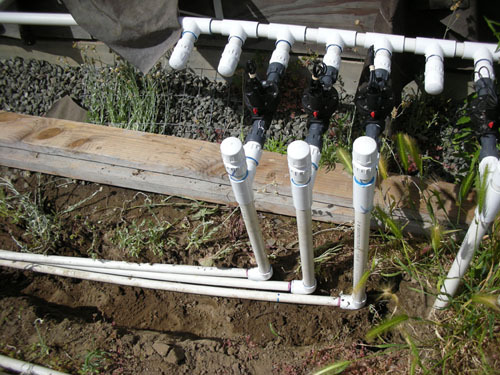 Then I can run the flexible tubing for the fixtures. 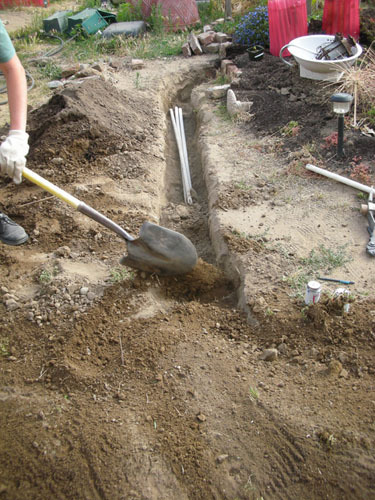 As I finished a section of plumbing, Noel came behind me and filled in the trench. 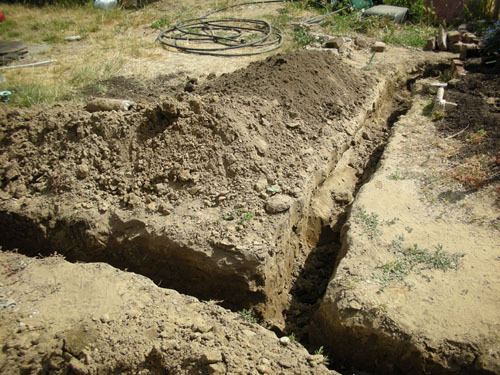 We figured this was a good idea to get done sooner as we've had some dog-falling incidents and the longer you leave an open trench, the more likely you are to end up with somebody in the trench. It'll be nice to be done with all the trenching. It'd be even nicer if the rest of the plumbing would magically finish itself.